This is the beginning of the diary of a window box garden. The garden doesn’t exist yet but it soon will. For now it’s a figment of my imagination that bloomed overnight. I’m conjuring up something slim and trough-like, stuffed with neat little bushes and romantic trailers. It sits outside my bedroom window, all knitted about with growth. If you lack outside space to call your own, but feel your fingers have a certain amount of green about them, it’s heartening to know that many plants can cope with an entirely container-bound life. If you’re a serial renter of small spaces in big cities, it’s also good to know you can create and tend a plot that’s completely portable. The box garden I’m going to create will be tiny – with dimensions in centimetres not metres square – but it will have much potential. It could be planted with attractive autumnal edibles like green frills mustard, endive, blood veined sorrel, giant red mustard and mizuna ‘Red Knight’. Or delicious hardy herbs like chervil, mint, rosemary, sage and thyme. Or it could hold a textured mix of evergreens like ivy, lavender, heather and hebe. 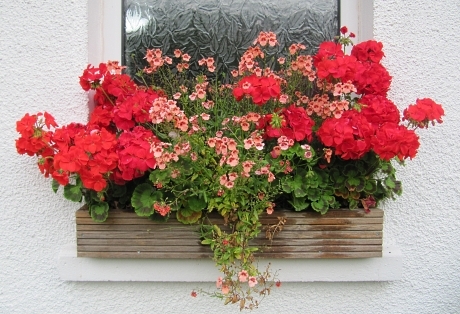 I’m feeling inspired after witnessing the transforming, fiery beauty of a window box in Wales. It was filled with scarlet pelargoniums and peachy diascia – petals that painted a cool white wall with hot summer. The reds and oranges were reflected and doubled by the glass they rested against. Back in a London that’s feeling rather gloomy under a fat rain cloud, I’m craving the heat that tiny garden gave off. But don’t mistake me for being anti-capital; I love this place. What I love most is its endless capacity to surprise. It’s both brilliant and reassuring to know that a huge swathe of this heaving, seething city is natural land and that numerous wild things thrive here. And I think attempting to be a grower in the face of spatial limitations and other urban excuses is important. Let all London’s window ledges host window boxes. Gardening in a small boxy space, in a place that you can’t really call your own, isn’t uncommon and there are lots of great resources to help you make good window box decisions. For now I will be stealing planting and planter ideas from the London streets – especially Islington pubs and the Barbican – as well as balconyboutique.co.uk, rocketgardens.co.uk and thebalconygardener.com. And then the work will begin.